During a discussion at Brookings on Tuesday, Javier Solana, Brookings Distinguished Fellow and the former European Union High Representative for Common Foreign and Security Policy, offered cautious optimism on the prospects for achieving a comprehensive nuclear accord with Iran. Solana, who also served as Secretary General of NATO among other posts, has a uniquely informed perspective on Iran. During his decade as EU foreign policy chief until he stepped down in late 2009, he played a central role in dealing with Iran over the newfound evidence of its nuclear activities, initially helping to persuade Tehran to suspend the most sensitive aspects of its nuclear program. Later, after Iran ended that suspension, Solana worked to craft a common strategy toward Iran with Washington and other world powers. Solana has known Rouhani for 14 years, and he immediately recognized the significance of his election to the presidency last June. In our conversation this week, he recalled that he had followed Iran’s presidential campaign closely, and was struck by the intensity and candor of the discussion on the nuclear issue. Solana himself was referenced during one of these debates, broadcast live on state television only a week before the ballot, by one of the candidates who criticized Iran’s own approach to the nuclear negotiations as a failure. 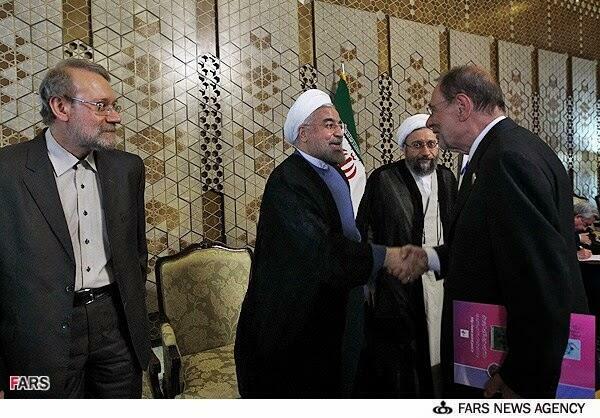 In what can only be interpreted as an effort to signal his readiness to negotiate in earnest on the nuclear issue, Rouhani personally invited Solana to attend his inauguration last August. The presence of a European dignitary at the ceremony was unprecedented, but Solana remarked at his positive reception. While in Tehran, he met with an array of current and former senior officials, and was welcomed to the parliament, where — in contrast to previous public rhetoric from that body — he was greeted with expressions of support for his efforts to mediate a resolution to the nuclear impasse. Over the course of the past nine months, the former EU foreign policy chief has maintained a dialogue with Rouhani and with Foreign Minister Mohammad Javad Zarif. In Solana’s initial conversation with the Iranian president-elect, Rouhani shared his ambitious plans for the nuclear negotiations, including the decision to shift the nuclear portfolio into Zarif’s hands — and “everything Rouhani told me became true.” For Solana, this ability to deliver on his promises with respect to the nuclear issue attests to Rouhani’s credibility and underscores the opportunity of the current process. What has also changed dramatically is the relationship between Washington and its European partners on Iran. Solana initially took on the Iran portfolio at a time of significant transatlantic tensions, and public differences between the Bush administration and European capitals on how to respond to revelations of a long-covert Iranian nuclear program. He helped bridge those differences, and in 2006, when the Bush administration agreed to join forces with Europe in negotiating on Iran’s nuclear program, it was Solana who represented the newly minted P5+1 — better known in Europe as the EU3+3 — in conveying the multilateral offer to Tehran. Solana credits the progress that has been made since Rouhani took office to the seriousness of purpose that is shared more than ever before by both Iran and the P5+1. “This is a negotiation that has as its objective by both sides to secure an agreement.” In addition, he said the coherent approach and structure for the talks has proven to be an important factor; by creating a process that is “rational, organized, and looks and plans ahead,” the negotiations stand a far better chance of success. A crucial aspect, Solana noted, has been the ability of all parties to insulate the nuclear talks from other frictions and crises, including Syria. Still, as a diplomat who helped broker important breakthroughs with Tehran, but also experienced first-hand the frustrations of devising a durable resolution where the differences are so profound, Solana described himself as realistic on the likelihood of a deal in July. He recalled his optimism during his final round of talks with Tehran as EU foreign policy chief in 2009, which happened to be the first meetings where senior U.S. and Iranian officials engaged in a direct bilateral discussion on the nuclear issue.